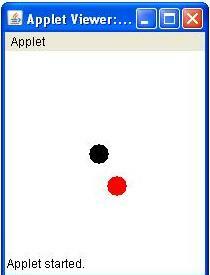 In Previous article, we have seen the life cycle of Applet. In this example, i will dem0nstrate that how we can animate ball and bounce it around the walls. Please give your feedback on this article, so that i can improve it in future. displacementOperation() method checks the boundary condition for ball object. lets say if balls x coordinate is crossing the maximum allowed values it should be re bounce. Hi Shiva, works beautifully. But I was puzzled by it. But looks like that it is so because repaint() does not call paint(Graphics g) when the frame is minimized. The second message still prints out and CPU cycle is consumed. Maybe thread synchronization should be used in start and stop methods to actually pause the execution for it to work like a true applet?Anyways it works beautifully for the present purpose. Hi , After a lot of effort I managed to make it work like I expected. Some additions and some changes to the original code. how to insert a background color o image?